Learn how to create smooth lustrous yarns with silk, a gorgeous but tricky and sometimes intimidating fiber. 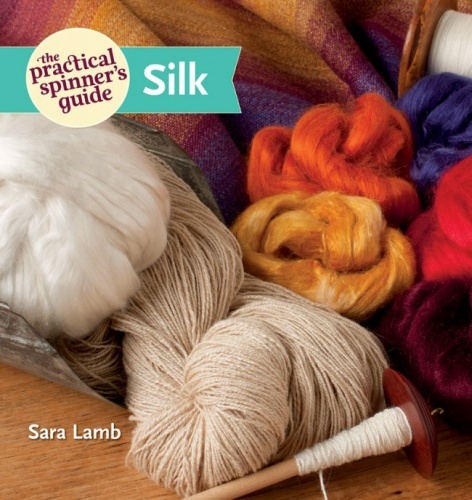 The Practical Spinner's Guide: Silk teaches spinners how to create smooth lustrous yarns from a gorgeous but tricky and sometimes intimidating fiber in this second installment in a series of fiber specific books. Author Sara Lamb discusses the various forms in which silk is available--combed top, bricks, noils, hankies, and bells--and how best to card, prep, and spin them, specifically touching on trouble spots such as drafting and adding twist. She also covers finishing yarns--cleaning and degumming, setting twist, and plying--and even touches on what dye processes are best for adding color, as well as how to blend silk into other spinning fibers. Sara includes brief discussions on spinning for both knitting and weaving, the properties of woven and knitted fabric, and what the spinner needs to take into account while creating yarn for a subsequent project.